"So, what type of budgie are you?" A budgie is a colorful and highly-entertaining feathered friend. While the green or blue colored budgie might be seen more commnonly, there is, in fact, a much wider range of color varieties available. Although there are more similarities than differences between the budgie types, some have distinctive traits. A wild budgie is predominantly grass green with a yellow head, blue feathers in his tail and black markings. This is the original budgie. Over time, mostly through breeding programs, variations in color and markings have emerged. These deviations from the original green have produced new varieties of budgie. Typically, these are grouped not by color but by terms, such as normal, opaline, pied, cinnamon, blackface and spangle. So, if you are buying a budgie, look for the description of its color and variety. 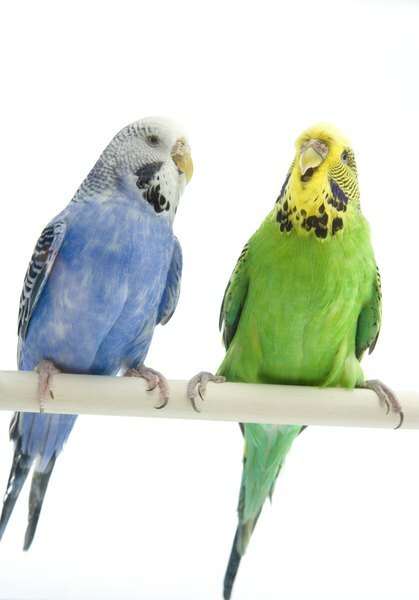 For example, you might have a sky blue (color) opaline (variety) or a green (color) normal (variety) budgie. According to "The Everything Bird Book," the Budgerigar Society recognizes 41 varieties of budgie, so there are plenty to choose from. Budgies with markings closest to the wild budgie are classified as normal. Typically these are black. However, some varieties have brown markings, such as the cinnamon. You also can find budgies with grey markings that range in color from a distinctive grey to an almost invisible coloring, notably the greywing and clearwing varieties. There even are albino budgies that have no markings at all. 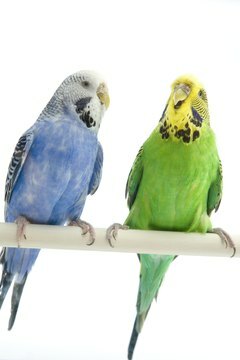 The pattern of markings in these varieties is similar, but some varieties, such as the opaline, blackface and spangle budgies, have distinctively different markings around the head and on the wings. Opaline budgies are easier to find than some of the rare varieties, such as the blackface. Opaline budgies are lighter colored and the overall effect is that of a brighter colored bird. Another way to distinguish this variety from the normal budgie is to look at his wing markings. On a green budgie, the wing markings are yellow or white. In the opaline these markings are the same as the bird's dominant color. Also, the bar-style markings on his head are much finer and he has no, or barely visible, markings on his back, between his wings. As the name pied suggests, these budgies have areas of body colors and markings missing compared to the normal budgie. Most pied budgie varieties have developed from breeding programs. For example, the Australian Violet Pied budgie emerged in the 1950s. This particular color mutation is caused by an irregular loss of melanin. The Danish pied, also known as a Harlequin, is mostly base color -- usually white or yellow -- and he has little or no body color, such as blue or green, although you might see some splotches of these colors on him. How Did Parakeets Get the Name Budgie? Why Is My Budgie Pecking Me? What Is a Cere on a Budgie? Can You Have Three Parakeets in One Cage? What Does a Parakeet Love? Is a Budgie a Herbivore?